First reports from Australia and other countries in the Far East, as well as some European countries, indicate that a large number of bright meteors were seen already during the night of 16–17 November, with a high proportion of very bright fireballs. Some of these were brighter than magnitude -8 and produced long-lasting trains. According to IAU Circular 7052, issued on 17 November, the "... rates increased from about 10/hr around Nov. 16.4 UT (G. Zay, Descanso, CA) to about 140-150/hr around Nov. 16.9-17.1 (M. Langbroeck and H. Zhao, Delingha, Qinghai, China; and K. Hornoch, Lelekovice, Czech Republic). A. Pereira (Cabo da Roca, Portugal) observed 214 Leonids during Nov. 17.13-17.24. However, A. Fitzsimmons reports that a group of observers at La Palma observed about 1000 Leonids/hr around Nov. 17.15, increasing to about 2000/hr around Nov. 17.19. J. Gluckman, D. Healy, and others near Sierra Vista, AZ, reported 423 Leonids during Nov. 17.36-17.45, while A. Hale (Las Cruces, NM) reported only 126 Leonids during Nov. 17.38-17.47." 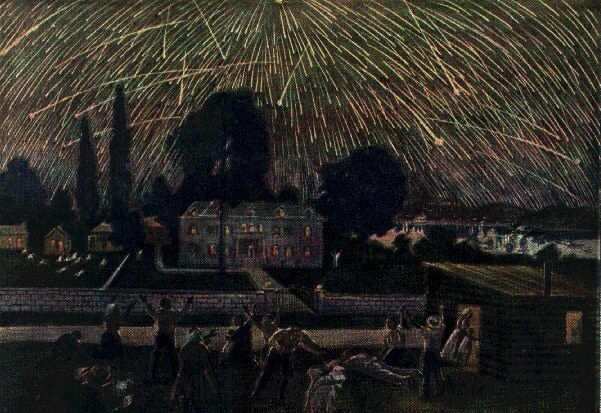 It is expected that the Leonid meteor shower may develop into a "storm" in 1998 or possibly 1999. During recent days, ESO has received an enormous number of requests for further information about this event. The study of meteors is not among the primary tasks of this organisation, but this page has been set up at short notice in order to provide some basic information and links to some related websites to all interested parties. Every year, near the middle of November, the Leonid meteor shower may be observed if the sky is clear. It is produced by small dust particles that enter into the Earth's atmosphere at high velocity and start to glow because of the friction produced when they collide with atoms and molecules in the Earth's upper atmosphere. It has been known for some time that these dust particles are left behind by Comet Temple-Tuttle which returns every 33 years. During these passages, the "dirty-snowball" nucleus of the Comet is heated by the Sun and consequently loses much gas and dust. The dust particles move on in orbits around the Sun that are similar, but not identical, to that of the Comet. The Earth's orbit crosses that of the dust particles around 15–17 November. It is during this time that a particularly large number of meteors may be observed. The dust particles move in parallel orbits and are referred to as the Leonid Stream. It thus appears to an observer that the related meteors all come from about the same direction, that is the same point in the sky. For this particular meteor stream, the point (the radiant) is located in the northern constellation of Leo (The Lion), hereby given the name to these meteors - the "Leonids". About 10–12 other important meteor streams are known with related meteor showers at different times of the year. Comet Temple-Tuttle passed its perihelion on 28 February this year and crossed the orbit of the Earth one week later. It is for this reason that there is now a particularly good chance to see many meteors in the night between 17 and 18 November, 1998. The predictions are extremely uncertain, but a true "meteor storm" may possibly develop, resulting in up to one meteor per second to be seen. Also for this reason, spacecraft operators around the world have become somewhat worried that collisions may occur with incoming Leonid dust particles. It has proven to be very difficult to estimate the real risk, but some spacecraft will be turned during the predicted time of maximum (November 17.8 UT), so that the possibility of damage is decreased. Many amateur organisations and some professional observatories will perform detailed observations of the Leonid meteors. They range from simple visual counting of the meteor rates to elaborating triangulation by means of photographic and radar observations which allow the determination of exact meteor trajectories through the atmosphere. These, in turn, may then be extrapolated backwards, so that the true orbits in space can be found. The following list of links is far from complete but allows easy access to some of the major Leonid sites on the web.